The images on this 1999 tour were taken pre-digital cameras. Photos appearing here were all scanned with somewhat primitive technology at that time, resulting with images of poor resolution. I started the tour in Sidney, BC and met my two fellow tourers en-route. Tim joined me at the Brentwood Bay ferry terminal, then after taking the ferry and cycling up to Duncan, we met up with Larry at the local McDonald’s there. We weren’t a 100% sure if Larry was going to show, but there he was, on his old Apollo (27″ tires and no spare!). I was pleased that they both had decided to accompany me on this tour; of course, how could they resist my “glossy brochure type” promises of fantastic scenery, superb cycling, splendid weather and babes on the beaches? Ready to go up island? Well not quite, I looked down and my back tire was soft, great, first flat. Well at least it wasn’t raining, yet! I found that the rim tape had slipped sideways and exposed a sharp edge from the spoke hole. Luckily I had some brand new Michelin plastic rim guard, so I slipped it on and away we went north on Vancouver Island Highway 1 (which changes to Highway 19 at Nanaimo). Somewhere around 2010, the City of Nanaimo completed a multi-use trail adjacent to the Esquimalt and Nanaimo railbed (E&N). Now this a much preferred route rather than the Parkway route that we rode around the city back in 1999. Check out http://www.nanaimoregionrailtrail.ca/ for more information. A quick stop for lunch in Ladysmith, and although it was nearly the end of June, the weather was still cool enough for hot chocolate all round at the waterfront concession. Further up-island, instead of negotiating Nanaimo’s endless traffic lights and through-town traffic on Highway 19A, we took the Nanaimo Parkway (still Highway 19), which is a bypass route with nice wide shoulders that is usually not too busy. The Nanaimo Parkway has a bike path that parallels it, and although paved, it’s like a mini roller coaster, probably great for the casual riders, but for the fully loaded touring cyclist, just another obstacle! Our first destination was Rathtrevor Provincial Park/Beach and we arrived to find hardly anyone in the walk-in camp area. 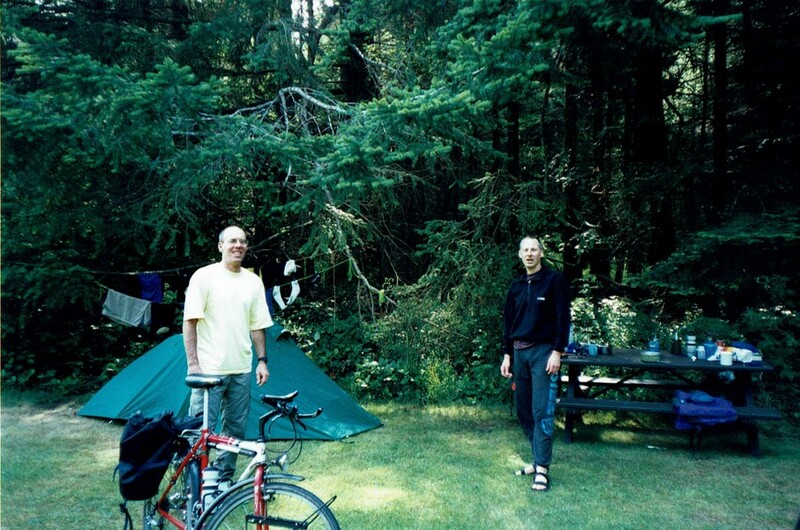 Rathtrevor is one of the few Provincial campgrounds in BC that has a decent walk-in tenting area, similar to the hiker-biker camps in the USA. 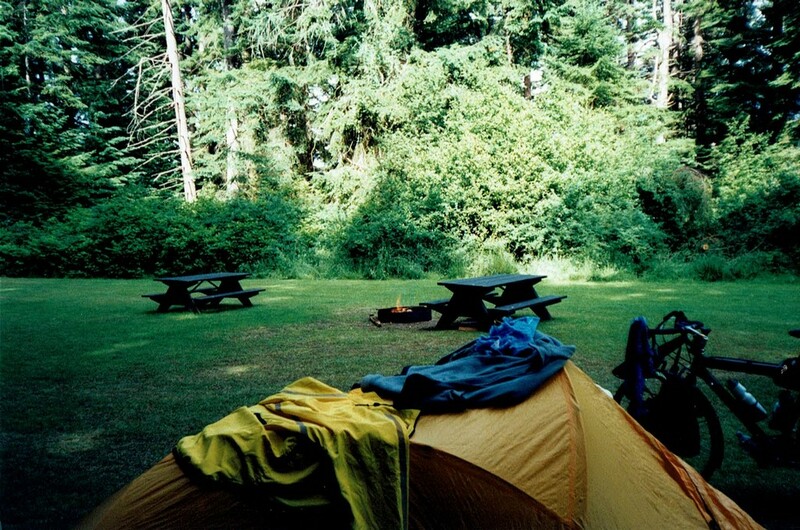 Most other Provincial Parks (PP) require you to use a regular site at full price, even if you’re on your own with a small tent. The town of Parksville was close-by enough for groceries for our dinner. After dinner we even managed a small fire that evening. Next morning after some breakfast we were off and on our way to Miracle Beach PP near Courtenay. After riding a few kilometres through Parksville we were about to rejoin the highway and ride along the coast road when a lady cyclist at the other side of the road came out of a gravel access road and started shouting to us. She told us that the route we were going to take, although scenic, was narrow and busy. We already knew this, “So what’s the alternative we asked?” The lady then informed us that she had ridden down from Courtenay on the brand new inland freeway 19 that was not quite open to motorized traffic yet, but was fully paved and freshly painted with divider lines etc. So off we went over the gravel berm and there it was, a four lane major highway and no vehicles. Almost one lane each all the way to Courtenay! We hardly met anyone on this route except for a few roller-bladers, who were obviously locals in the know about the new highway. This portion of the Island Highway (Highway 19) is now open and extends all the way to Campbell River. Funnily enough, the best route for cycling now, is the route we were going to take, along the coast (now Highway 19A), as the bulk of the traffic is now using the Inland Highway. The road was great, but unfortunately the rain decided to start up! It didn’t rain too hard though, just enough to soak our campsite at Miracle Beach! I thankfully had a small tarp with me, which proved to be very useful over the picnic table that evening (as it would on many other occasions!). It has been an exceptionally wet spring in BC this year and it seemed that we were at the tail end of “monsoon season.” The worst part of the damp spring was that every time the sun showed its face, I think that a million mosquitoes decided to hatch (and follow me). Throughout the whole trip we were to encounter many of the biting beasts, including their buddies, the black flies! I had just settled down in my tent when I heard Larry lamenting, where are the babes on the beach that you promised?” “Soon Larry, soon,” I lied! The tents went away wet the next morning and we were on the road to Sayward. A pretty dismal day, drizzling with rain and fairly cool. The rain did stop just before we arrived at Fisherboy Campground, on the outskirts of Sayward, and the sun peered out and allowed us to get our tents dry. The campground had a laundry facility which was well utilised by us for our wet gear, much appreciated! Had dinner, then the rain started again. It’s a good job that every day’s riding provided some great scenery, as that almost helped us forget the wet conditions. Another lady cyclist showed up at this campground, she was travelling south on what looked to be an unsuitable bike and looked very tired. She chatted for a while about her trip and was considering tenting, but after the rain drops stared, she opted for one of the available cabins that night. We left the Fisherboy campground and started on our trek north again. Almost as soon as we started on the highway, Tim came up behind me and said “did you see the bear?” “What bear?” Was my reply, he then proceeded to tell me about the bear that watched us leave the campground from the side of the road! I missed it, I guess my mind was elsewhere! After just starting back on the highway, we found our first steep climb of the day, oh joy, the morning warm-up, and the rain had decided to start too! Two-thirds of the way up the hill, Larry gets a tire puncture, why does it always happen on a hill? Larry got the flat fixed, but we noticed that his back tire wasn’t in great shape, so we suggested that he get a spare ASAP. Of course Larry being Larry, we found later that we had to coax him at every opportunity! We also noticed that day, that Larry had slowed down considerably and concluded that perhaps the long days and mileages were wearing him down. Larry finally admitted that day that his knees were acting up and slowing him down. He normally doesn’t ride long distances, so Tim and I figured that it was going to take a few days for him to “acclimatize” himself, if his knees held out! Later on, we stopped at a small park to have a bite to eat and a rest, but the only shelter from the heavy rain was a narrow roof over an information sign! We huddled under that for a few minutes while we snacked, and then moved on. 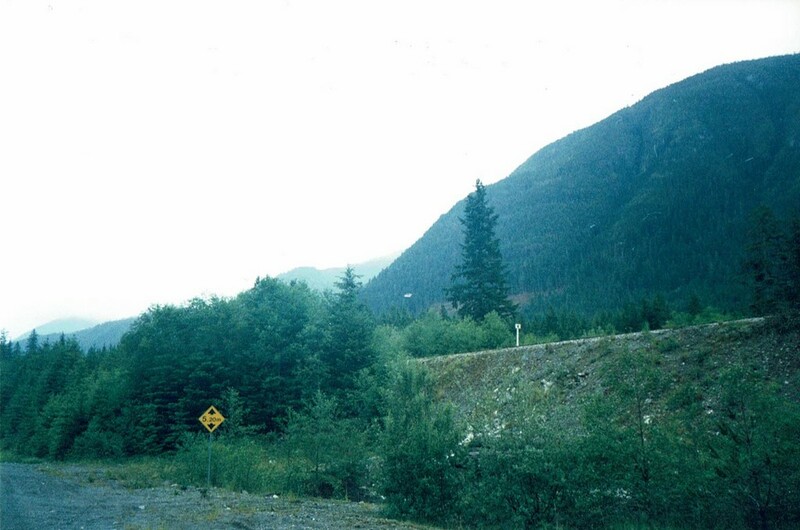 Eventually, we arrived at Woss for a rest stop, and we were thoroughly wet. There was a nice little restaurant in Woss, so we stopped there for some hot soup and a dry-out. We also met up again with our cyclist friend (the big pannier guy) there. We talked for a while and found out that Eric was from France, and had been touring all over the world, you name it, South America, Europe, China etc., he’d been there. 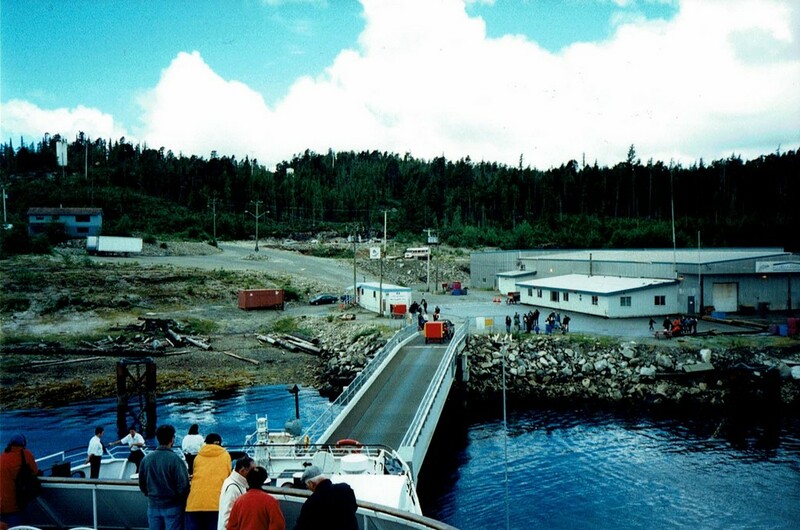 He was heading to Alaska this trip, and would be catching the same ferry as we were in Port Hardy. He normally tried to make it home to France, once a year at Christmas, but otherwise was busy touring wherever. He was planning to tour in Africa after this present venture, quite the guy. Reaching our first objective of Nimpkish Lake, we found a service station and a very wet campground, not very appealing. As tired and as wet as we were, we decided to push on to Port McNeill for the evening to try and get a motel, as our tents were still wet from the previous night’s monsoon. 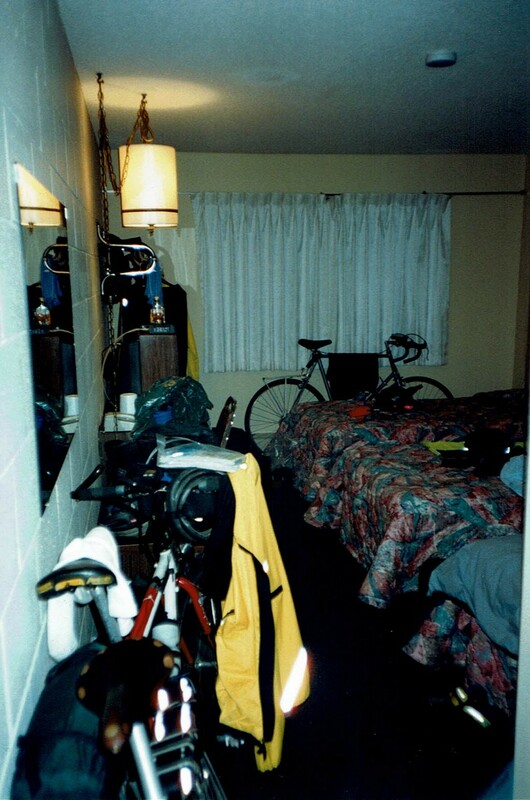 We found a small room with three beds which seemed even smaller after we snuck our bikes and gear in and then we hung wet clothes all over the place – not a very pleasant smell from that lot! What luxury though! A warm room, soft bed, and we even managed to dodge the rain squalls and go out for dinner! I did notice on our way to the motel in Port McNeill that we had a nice long downhill into the town. So when we left the next morning we had that nice warm-up ride, back up the long hill to the highway! It seems that most towns are at the bottom of a hill! Larry’s knees weren’t much better even with a night in the motel, so it was just as well that we only had a short ride to Port Hardy. I must admit even one of my knees wasn’t feeling too great after the long, cool and wet ride the day before. Guess what though? No rain on this day! We arrived early at the Wildwood Campground, which is the closest campground to the Prince Rupert ferry terminal; about 2 kms away. After pitching our tents, we took our empty bikes into the town of Port Hardy for some groceries and supplies. Back at the campground, we were camped on top of a bluff with a great view, but the wind was picking up and proved to be quite cool. Windshields were de rigueur for our stoves at dinnertime and the tents well pegged down. At 6:30 p.m. Larry said he was going to lie down (for a while); we never saw him again until morning! 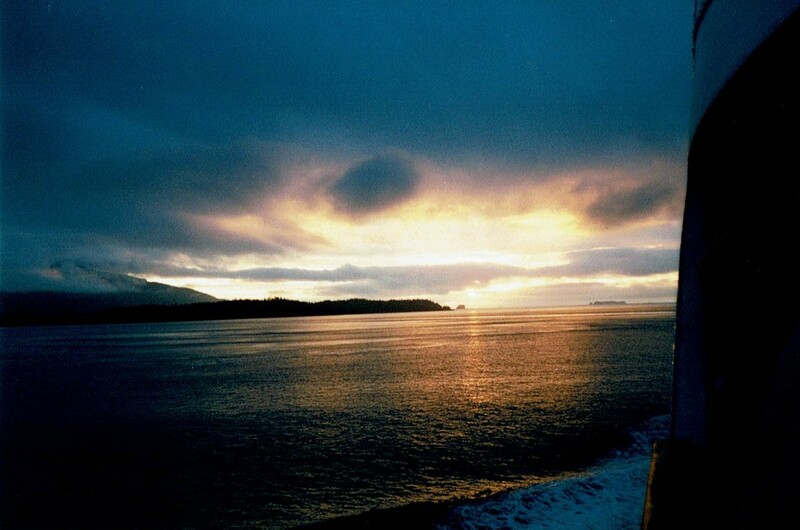 We were up sharply at 5:30 a.m. to pack up and catch the Queen of the North to Prince Rupert. It would be more or less a rest day. We rode the the 2 kms out to the terminal and saw our friend Eric camped on a grassy knoll, next to the washrooms outside of the ferry terminal. Free camping! We spoke to him again later and found that he very rarely used “regular” campgrounds and preferred to “guerrilla camp.” Or as he said, with his heavy French accent… “I like to camp in de bush.” His tent was large enough to accommodate himself with all his gear and his bike (no wonder he had monster bags on his bike!). Apparently he had camped like this all over the world and the only place he felt unsafe was when he was in a big city; then he would either use a hostel or stay with friends/acquaintances. 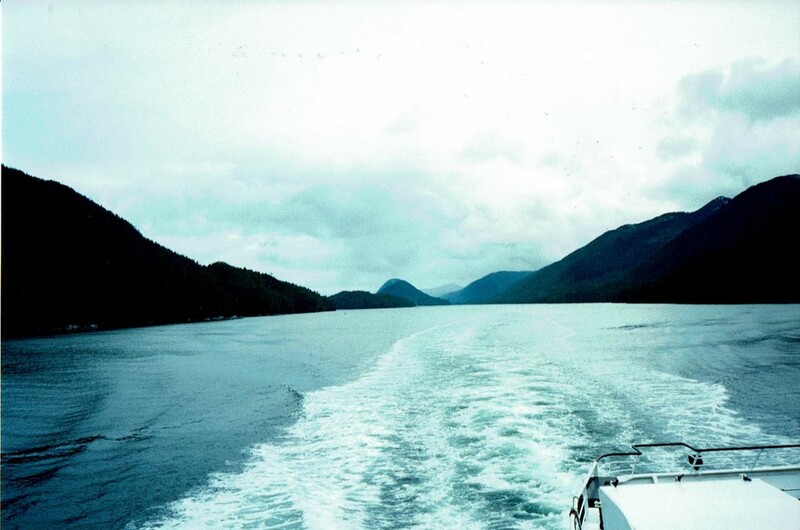 The ferry trip to Prince Rupert takes 15 hours and while the scenery is spectacular, if it is not misty, the journey is still tedious. Eric would have 30 hours more on another ferry to Skagway, Alaska after this one! We only made one stop at Bella Bella to offload some supplies and passengers. I had pre-booked a motel in Prince Rupert as I knew we wouldn’t arrive until 11:00 p.m. or later and I didn’t fancy looking for a campground and setting up camp in the dark. The motel was very close to the ferry terminal and once again that soft bed was sure nice! On March 22, 2006, with 101 persons aboard, the Queen of the North (the very ferry that we sailed on) failed to make a planned course change, ran aground and sank. Two passengers, whose bodies were never found, were lost in the tragedy. 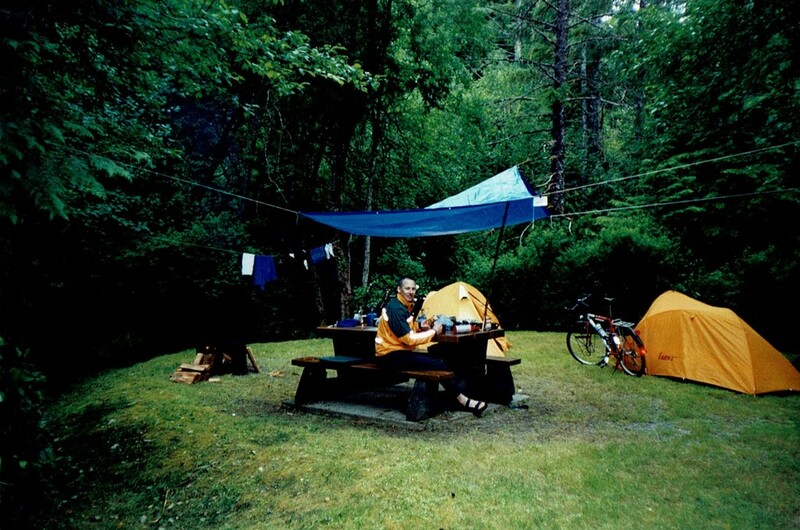 This entry was posted in Cycle Touring, Home, Touring Journals, Vancouver Island, Western BC and tagged 100 Mile House, BC, BC Ferries, Bella Bella, Bike camping, Bike Touring, British Columbia, Camping, Canada, Duffy Lake, Port Hardy, Prince George, Prince Rupert, Whistler on July 25, 1999 by AdamK's Cycling & Travel.